Los Padres National Forest is a United States national forest in southern and central California. Administered by the United States Forest Service, Los Padres includes most of the mountainous land along the California coast from Ventura to Monterey, extending inland. Elevations range from sea level to 8,847 feet (2,697 m). A northern view looking over-top Los Padres National Forest. 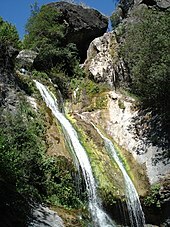 Salmon Creek Falls, near the Big Sur coast, just outside the Ventana Wilderness. The forest is approximately 1,950,000 acres (7,890 km2) in area, of which 1,762,400 acres (7,130 km2) or about 88% are public lands; the rest are privately owned inholdings. The forest is divided between two noncontiguous areas. The northern division is within Monterey County and includes the beautiful Big Sur Coast and scenic interior areas. This is a very popular area for hiking, with 323 miles (520 km) of hiking trails and 11 campgrounds (ranging from very rugged to suitable for recreational vehicles). This division also contains the Ventana Wilderness, home to the California condor. The "main division" of the forest includes lands within San Luis Obispo, Santa Barbara, Ventura and Kern Counties, with a small extension into Los Angeles County in the Pyramid Lake area, between Castaic and Gorman. Mountain ranges within the Los Padres include the Santa Lucia Mountains, La Panza Range, Caliente Range (a small part), Sierra Madre Mountains, San Rafael Mountains, Santa Ynez Mountains, and Topatopa Mountains; the highest parts of the forest are not within named mountain ranges, but are adjacent to the western San Emigdio Mountains and include Mount Pinos, Cerro Noroeste, and Reyes Peak. The forest is also adjacent to the Angeles National Forest, which is in Los Angeles County in Southern California and is nearby Carrizo Plain National Monument in eastern San Luis Obispo County. Forest headquarters are located in Goleta, California. There are local ranger district offices in Frazier Park, King City, Ojai, Santa Barbara, and Santa Maria. Many rivers in Southern and Central California have their points of origin within the Los Padres National Forest, including the Carmel, Salinas, Cuyama, Sisquoc, Santa Ynez, Coyote Creek, Sespe, Ventura, and Piru. Several wilderness areas have been set aside within the Los Padres National Forest, including the San Rafael Wilderness, the first primitive area to be included in the U.S. wilderness system after the passage of the Wilderness Act in 1964. Another large wilderness created in the 1970s was the Ventana Wilderness in the Santa Lucia Mountains. A total of 48% of the total area within the forest has a wilderness designation. Santa Ynez Recreation Area, in the Santa Barbara Ranger District. Many threatened and endangered species live within the forest. Probably most famous among them is the California condor (Gymnogyps californianus), for whom the United States Forest Service established the Sespe Condor Sanctuary. Also present is the California mountain kingsnake, a California species of special concern. The American peregrine falcon is also entirely dependent on the forest for its survival. The mountain lion and California mule deer may be the most common large mammals. Bighorn sheep inhabit the Sespe Creek region of the forest. American black bears browse on grasses, berries, and carrion. Coyotes thrive everywhere in this forest. Bobcats can occasionally be seen in the more remote mountainous areas of the forest. Other animals found in this forest are raccoons, bluebirds, barn owls, red-tailed hawks, cottontail rabbits, bald eagles, jack rabbits, California quail, California scrub jays, and great horned owls. Many vegetation types are represented in the Los Padres, including chaparral, the common ground cover of most coastal ranges in California below about 5,000 feet (1,500 m), and coniferous forests, which can be found in abundance in the Ventana Wilderness as well as the region around Mount Pinos in northern Ventura County. Researchers estimate the extent of old growth in the forest is 18,900 acres (76 km2). It consists largely of Jeffrey pine (Pinus jeffreyi) forests, although old-growth coast redwood (Sequoia Sempervirens), coast Douglas-fir (Pseudotsuga menziesii var. menziesii), and white fir (Abies concolor) are also found there. In 2008, scientist J. Michael Fay published a map of old growth redwoods in and around Big Sur as a result of his transect of the entire redwood range. Condor Lookout on Hi Mountain, Santa Lucia Range. This is an old fire lookout, remodeled into a public Condor lookout and educational center. Due to the very dry summers, forest fires in Los Padres National Forest are always a risk. In 1965, a truck driven by country singer Johnny Cash caught fire, and burned several hundred acres in Ventura county. In August 1977, the Marble Cone Fire burned 178,000 acres (720 km2) within the Ventana Wilderness and portions of the Los Padre Forest. In June and July, 2008, the Basin Complex Fire torched 162,818 acres (658.90 km2) in the same region. Due to the fire risk, there are seasonal restrictions on building fires. Some portions of the forest are closed entirely to public entry during the peak fire season, which usually extends from around June 1 to mid-November. A National Forest Adventure Pass is required for parking in most locations of the Los Padres National Forest, as well as other National Forests in Southern California. The pass is not required in the Monterey Ranger District including Ventana Wilderness and Silver Peak Wilderness. Los Padres means "the Fathers", referring to the Catholic missionary priests of the Spanish missions who proselytized in and around the area in the 18th and 19th centuries. After the consolidation of the forests, the name Santa Barbara Forest was resented by residents of the other counties for being too closely identified with just the one county. Amidst public pressure, park administrators therefore changed the name to Los Padres to be more representative of the regional history. China Camp is a public drive-in campground near the summit of 5,000 foot (1,500 m) Chews Ridge in the Monterey District of the Los Padres National Forest. The camp is about 34 miles (55 km) and a 90 minute drive from Monterey. The summit is 19.9 miles (32.0 km) from Carmel Valley Village and 10.9 miles (17.5 km) from Carmel Valley Road on Forest Route 18S02/Tassajara Road. The camp site is the eastern trail head of the Pine Ridge Trail. The Chews Ridge fire lookout tower, built in 1984, is nearby. There is a modern pit toilet. No water is provided. There are nine campsites that can be reserved in advance. Fees are $20 per night and allow one vehicle per site. Additional vehicles cost more. There is no overnight trailhead parking without a campground reservation. Portions of the road from Tassajara Road to Chews Ridge are suitable for high-clearance vehicles or four-wheel drive vehicles. During the winter or in inclement weather, the road may not be passable. The road continues over the mountain 7.9 miles (12.7 km) down a very narrow and steep dirt road suitable only for four-wheel drive vehicles to Tassajara Hot Springs. ^ "Mount Pinos". NGS data sheet. U.S. National Geodetic Survey. Retrieved 2009-06-29. ^ "Los Padres National Forest". Great Outdoor Recreation Pages. Retrieved 3 November 2013. ^ "Black Bear Population Information". California Department of Fish and Wildlife. Retrieved 2019-03-29. ^ Johnson, Brett (2007-11-18). "Johnny Cash's first wife tells of romance, heartbreak — They walked the line". Ventura County Star. Archived from the original on 2009-02-28. Retrieved 2014-06-01. ^ "Top 20 Largest California Wildfires" (PDF). CAL FIRE. Retrieved 14 August 2015. ^ a b Brown, William S. (1945). History of Los Padres National Forest (PDF). San Francisco: Forest Service. p. 38. ^ "California Forest Fire Lookouts". Retrieved 2009-11-20. ^ a b "China Camp Campground". www.hikelospadres.com. Retrieved 28 August 2018. ^ "China Campground". Retrieved 28 August 2018. Wikimedia Commons has media related to Los Padres National Forest. Mountain Biking in the Los Padres National Forest- a website with maps, descriptions & links of various routes through the forest for wilderness camping on a mountain bike.